- Games, and your daily joke ! Children's Games, Family Games and Games for Adults. As well as being the best for educational advice and schoolbook seller, we also stock an interesting range of boardgames and other games for the family or for children. Some of our games are exclusive buys not available from other stores. Most are selected for fun, and if they are educational that is purely an accident - but some are certainly educational games like the Scirmish game which is excellent for English ! We now also have added a selection of joke tricks like Fly in Ice Cube and Sneezing Powder at only £1.00 to our range ! Some of our children's games and more adult games are below, and are explained if you click 'more'. And now you can also order from your PC, in Trinidad or wherever - so visit our Online Store to see more, or buy ! (you may need a free Macromedia Shockwave Player). 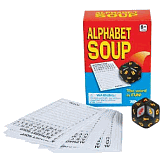 Alphabet Soup, letter dice word game £1.90 - more... Hard Line, a competitive adult 4-in-a-row game £4.99 - Buy. After Dinner Arguments, out of stock - more... Mousie Mousie, family fun dice boardgame £5.99 - Buy. Our online store (and Freeman Street shop) is designed with Grimsby and Cleethorpes parents and children especially in mind ( and visitors to this great bit of coast ! ). If there are Sats or GCSEs to be revised for, or just a developing mind to be sharpened, see our great range of CGP educational books, covering many subjects over a wide age range and exam range and widely used in schools and homes. We also exclusively stock the full range of Wilmot's Wizard Math Sheets for all ages. Or if family bonding and relaxation need that game or puzzle then we hold a great selection especially of jigsaw puzzles. Visit the store, or tour our website and online store. Your feedback is welcomed and we'll try to meet your needs. Vincent Wilmot, 166 Freeman Street, Grimsby, N.E.Lincs, DN32 7AT.